• “Dead Man’s Hand.” College card-shark, Toby, thinks it’s just another frat-house Poker night. The stakes are high and Toby is all in when a devilish coed mysteriously appears and calls his bluff. Story and art by Phillip Jacobson. • “Eldorado.” The sun sets on a three-hundred year quest for fabled riches and gold in this zombie Western, titled after the poem of the same name. Written by film director Sherezada Windham-Kent (Everything I Needed to Know About Zombies I Learned From the Movies, 2009) with art by animator/comics artist, Alex Cormack. • Artist Dirk Strangely (Graveyard Girl, Dirk Strangely’s Completely Inappropriate for Children Children’s Book) is inspired by the figure of Poe himself in two series of Gorey-esque portraits. 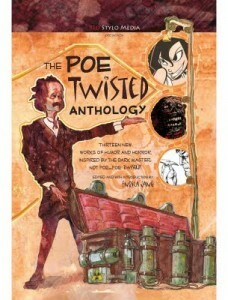 • Painter Andrew Jerz brings Poe spoofs to the big screen with a mini-collection of grindhouse movie posters: Lenore, Amonstrillado, and Careful Coffins for the Concerned Cataleptic. This entry was posted on Thursday, August 18th, 2011 at 4:08 pm	and is filed under Comics. You can follow any responses to this entry through the RSS 2.0 feed. You can skip to the end and leave a response. Pinging is currently not allowed. « Geek Image of the Day!!! Yoda+Ewok=Gizmo!! !